Ventev’s Chargesync Alloy Lightning cable is durable, attractive, and surprisingly dog-resistant. Let me explain: My Pomeranian, Dolce, loves to chew on expensive charging cables. She snaps through regular PVC-wrapped cables in a matter of seconds. Fabric-wrapped cables slow her down a little (I suspect because she like to savor the texture). She snagged the Chargesync Alloy cable off my desk when my back was turned. I estimate Dolce spent about 45 minutes gnawing on the cable. THe damage wasn’t pretty, but the cable was definitely still usable. This impressively durable $25 cable comes in seven colors (cobalt, gold, black, magenta, rose gold, silver, and steel gray) and one length (4 feet). The cable is pretty thick—about twice as thick as Apple’s cable—and wrapped in high-tensile material. The thickness of the cable combined with the slippery wrap is actually a good thing, because this cable is more likely to slip away than get caught under the wheels of your chair. The Lightning connector and USB port are housed in attractive brushed aluminum casing with thick, stiff rubbery material at the neck. The cable is a little clunky, but it does have a built-in Velcro cable tie for easy storage. There’s no question that the Chargesync Alloy cable is built to last, even with heavy use and unexpected dog hazards. Dolce did manage to make a dent in the cable’s wrap, but the damage she did was purely aesthetic—functionally, the cable suffered absolutely no damage. 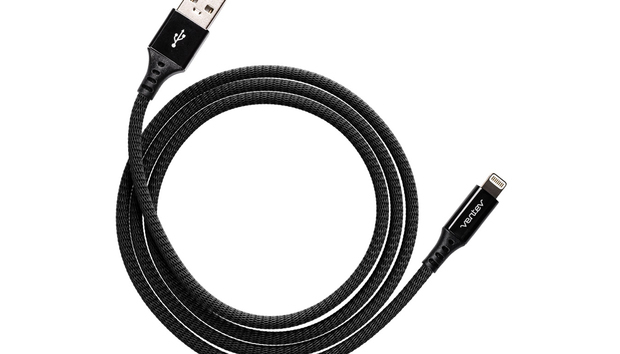 Ventev’s cable is probably one of the best choices if you have pets or children, but it’s not as slim or as malleable as other cables.